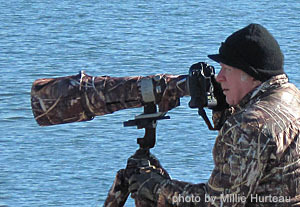 Much of my photography is done along North Carolina's coastline and inland coastal areas, where my favorite subjects are birds and wild horses. I also frequent many other locations along the eastern seaboard, with ducks, shorebirds and other waterfowl topping my list. My fascination for North Carolina's intriguing wild horses calls to me in the Fall and Spring. Winter is reserved for ducks and other waterfowl, and for eagles. In the heat of summer I gravitate toward songbirds around home. I may be in chest waders standing in the frigid waters of Core Sound after ducks in flight, or in spiked cleats on slippery jetty boulders after seabirds. You'll find me in a kayak paddling a salt marsh for birds and wild horses, or hunkered down in camo or in a blind patiently waiting for my subjects to come just a little closer. It all requires what I call "P.P.P.L." (Planning, Patience, Persistence, and Luck). None of it is easy, but still it draws me in for more. The payoff is when it all comes together for that inspiring image that makes it all worthwhile. For general chronicles of my photography adventures visit "Carolina Wild Photo - the Blog". For my kayaking trip reports, go to "The Casual Kayaker". My penchant for making many of my own photographic accessories is reflected in my do-it-yourself project articles in the "Equipment Notes" section, which includes some reviews and wildlife photography tips as well.